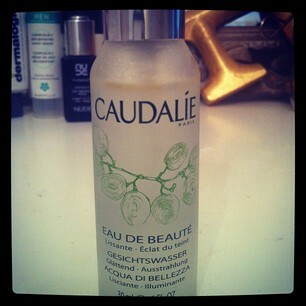 Caudalie's beauty elixir is one of those things you don't think you need until you have it, after a lot of umming and ahhing I eventually made the purchase and now I won't ever be apart from it. Well to start with Victoria Beckham is a big fan, in fact she tweeted her love for it, for some the Queen B's approval may be enough. The official blurb: Formulated for dull skins, Beauty Elixir contains an exceptional blend of antioxidants from grape extracts, orange blossom, rose, organic balm mint and rosemary that helps restore radiance to your skin. Inspired by the centuries old 'elixir of youth', used by Queen Isabelle of Hungary this is not a one trick pony. This versatile mist can be used as a toner, to set makeup, or for a much needed refresher. This facial spray helps to smooth skin, tighten pores and deliver a shot of radiance. It also works as an anti-bacterial shot, so spray through out the day to help keep those pesky spots at bay. I use it first thing in the morning, like a toner, to close my pores and wake up my skin. I use it to refresh my makeup when I am going out, for a nice dose of dewiness. I also spray it into my hands and inhale when I am feeling slightly nauseous, or next to someone smelly on the tube! It smells like peppermint and is really refreshing on the skin, think along the lines of berocca for your face. Essential for those days when you need to get up and glow. I have the miniature version, which I picked up from Paris, but is available from Cult Beauty. I keep the mini me in my handbag, but when pay day comes around the long and windy corner I shall be treating myself to the full size for my dressing table! Have you used the beauty elixir before? What do you think, worth the splurge?